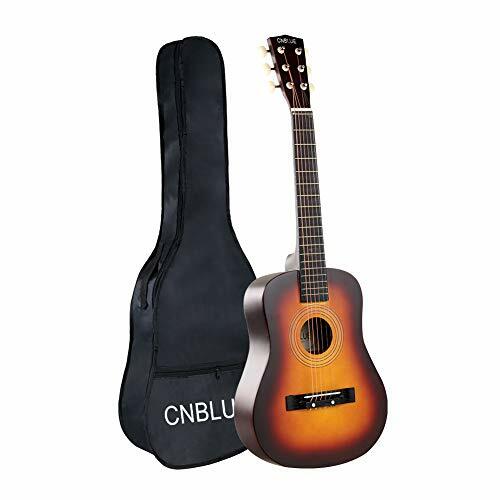 The CNBLUE 1/2 Size 30 inch acoustic guitar is a great, handcrafted beginner guitar. It’s a serious steel string guitar in a 1/2 size that comfortably fits the small beginner. The acoustic guitar features a sturdy & full-size dreadnought body with smooth curves, promoting comfort during playing. This solid basswood produce a smooth, rich, full and vibrant sound ideal for rock, folk, country and so on. Easy Tuning Heads: It is easy to adjust with the chrome geared tuning head to keep the guitar in tune. Smooth tuning pegs help a lot for people who are in hopes of training and learning acoustic guitar on their own. Guitar Material: Features a Laminated linden Top and sturdy and full-size dreadnought body with smooth curves, promoting comfort during playing. This solid basswood produces a smooth, rich, full and vibrant sound ideal. Guitar Size: 30 inch acoustic guitar is very suitable for children and adults who like small guitar. Guitar Strings: Steel Strings are traditionally used for acoustic music, folk or any other style of music. Guitar Choice: It would be a wonderful start instrument for a beginner. Usable by musicians of ALL levels. It really provides so much for such a small instrument.